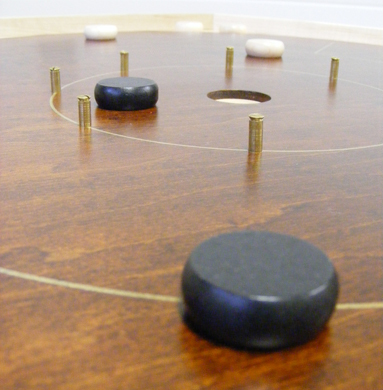 Crokinole [sometimes referred to as Pichenotte] is a great fun game for players of all ages. Presently making a huge comeback in popularity, it is deeply rooted in the past. Just where that past began seems to be debated though, even by those who say they’ve researched well. While many believe that play began in either Ontario or Quebec in the mid 1800s, based maybe on some ideas that immigrated with the players from Europe, others claim the game came complete in its present state from the pubs of England and the villages of France. Regardless of its birthplace, the game took hold and flourished in Canada well into the 20th century, strongest in rural areas and small towns pretty much across the country. Like many of the “simple pleasures” of a quieter time it was squeezed into smaller pockets here and there through the mid 1900s, thanks to all of the business that has over taken us. 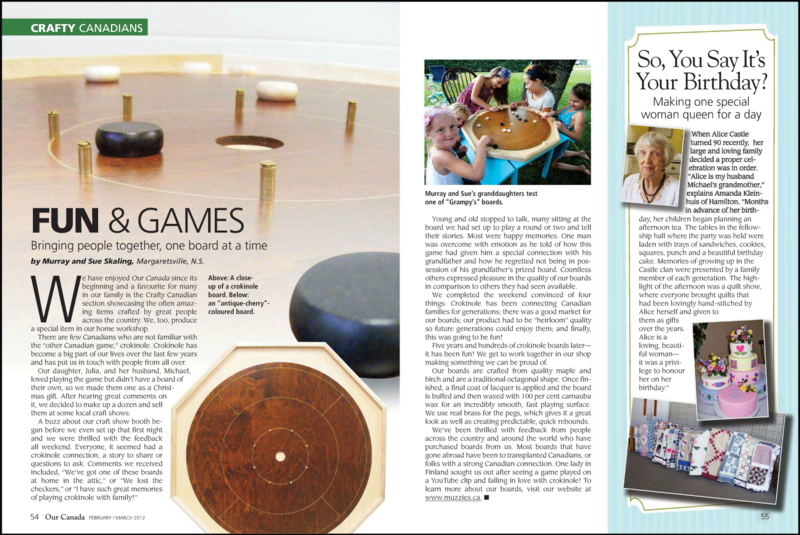 But in the last ten years or so, crokinole has been making a huge comeback, finding a place in the hearts of a new generation of Canadians, spreading rapidly into the U.S. and many other places around the world, thanks to loyal fans. And why not? What other game can bring friends and family of all ages together around the table so well; where laughter, good conversation, quiet teasing, cries of victory, and maybe moans of defeat keep time to the tick and click of checker against checker, post or rail — or that special sound as it slips softly into the centre “croke”? Rules of play are included with every board. For official tournament rules from the National Crokinole Association, click here. For more info on the game visit Board Game Geek’s Crokinole listing or wikipedia.